The drying garlic is stinking the flat out. Him Indoors says if it doesn’t get relocated PDQ he will be staging a protest. That means Captain Beefheart at top volume, so tomorrow morning it’s all going in the garage….! My Chantenay carrots on the balcony are a complete disaster. The planter wasn’t deep enough and they have more legs than most insects. Have replaced with Little Gem lettuces – my first lettuces! Am still digging the green bed. But the end is very definitely in sight. The next one will be less fun unless there is rain soon, it needs mattocking! Planted out 50 chitted Douce Provence peas (100% germination), and put the pot with the other 50 in the shed. Put out 4 celeriac with the squashes. Salsify is already poking up in the tub. 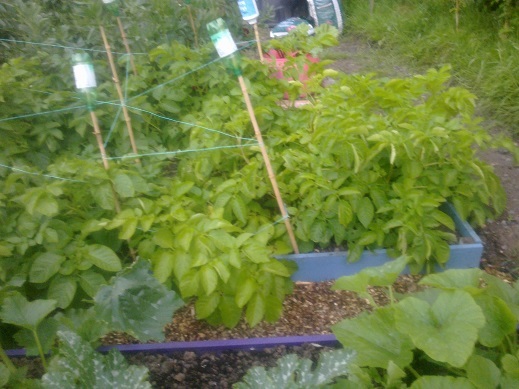 The front 6 rows of spuds, including the flattened ones, are going yellow. No blight yet, though some of my neighbours might be encouraging its chances with their love of watering their spuds from above with a hose. I’m taking the yellow as a sign that they are nearly ready to come out – they were put in 11 weeks ago today and flowered a few weeks ago. 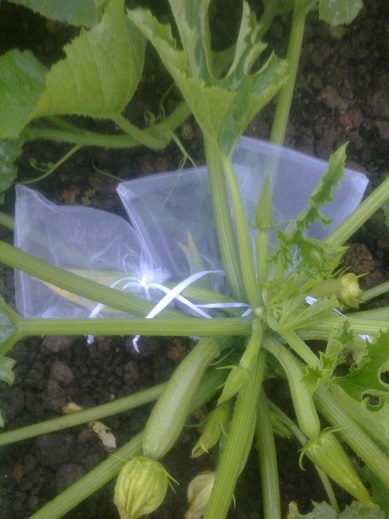 Finally saw 2 male flowers looking like they might open soon on the Genovese courgettes, so I whipped out the net bags and the flowers of those and 2 females are bagged ready for me to intervene tomorrow. This is a bit addictive, and I might also try my luck at this with a couple of squashes when they get going – if it works I will have more seeds than I know what to do with! Stayed till 10pm and was finally driven to go home by the evil biting things. Dehydrator arrived today – tomorrow sees my first load of strawberries going in. I bought a snazzy jar especially. 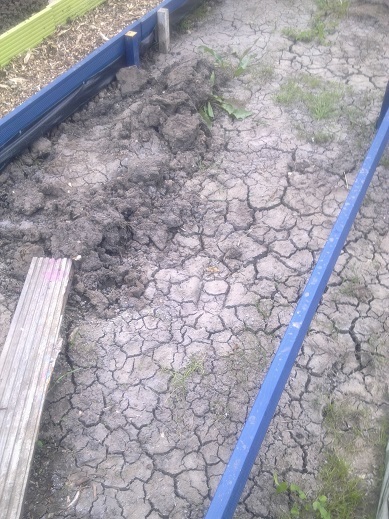 Need to sow winter brassicas!